BLOCK Design Build were tasked with refurbishing this Old Victorian music school in Dalston, East London - a building that draws on its heritage while looking to the future with its contemporary steel beams, original exposed brickwork and Victorian cast iron round window. It’s an ambitious restoration project perfectly suited to our original vintage industrial pendant lights that feature within. The lights were salvaged by us from the University of Birmingham’s School of Chemistry. Made in the 1960s by Holophane, the lights showcase the London-based manufacturer’s renowned built-in ribbed glass refractor which helps to produce an even illumination of light - a technique still in use today. They feature the original cast branding while an embossed maker’s mark can also be found on the shade. 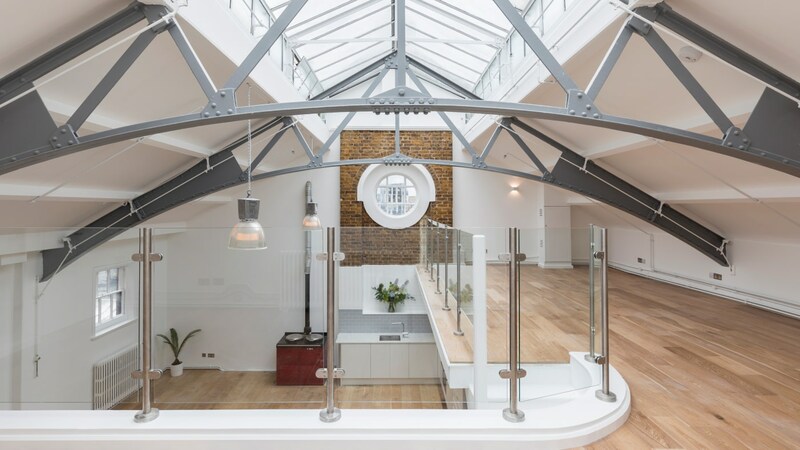 The two industrial pendants work well as statement pieces suspended from the high ceilings, while the polished aluminium upper galleries and glass shade tie in with the exposed steel beams and glass balustrade of the wider space.